The 2011 Dodge Charger Review: The Dodge Charger has received a major overhaul as the flagship vehicle of the Dodge Brand. Greatly improved quality is just part of this redesign. While there was some grousing in the Mopar enthusiast community over the presence of four doors on the last generation Charger, as the originals were coupes, this new one takes on some of the dramatic styling of the iconic 1968, 1969 and 1970 models. I remember watching the 1968 Charger as it was unloaded at the dealership and being amazed at its stunning presence. While the original 1966 and 1967 models were fastback versions of the Dodge Coronet sedan, the new ones flaunted sculpted sides, a tapered nose with hidden headlamps, extended sail panels on the roof, and dramatic taillamps. These new taillamps mirror the 1969-70 models in their full-width design, and include 164 LEDs for a dramatic impression. 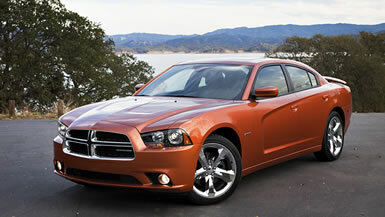 The EPA classifies the Charger as “Large”, so it has lots of road presence and there’s plenty of room inside. The interior is as redone as the outside. Since Fiat began running the show, extensive changes have been made to Chrysler interiors. The plastics have a high quality feel and look, padded and well fitted. My wife appreciated the quilted, stitched look of the door panels. The thick steering wheel feels both elegant and sporty. Situated in the center of the dash in my tester was the generously proportioned 8.4-inch (diagonal) Uconnect screen. I set destinations using the friendly Garmin navigation system, adjusted the fully automatic climate control (with humidity sensor) and played with the Audio system. I had some trouble figuring out how to set my iPod to shuffle and I had to reshuffle each time I got in to the car, but the system was otherwise flawless. Chargers come in three levels: SE, R/T and R/T AWD. Dodge offers separate “lifestyle packages” too, including Rallye, Rallye Plus, R/T Plus, R/T Road & Track and R/T Max. The RT/AWD model provides an all-wheel-drive system for enhanced traction in less than ideal weather conditions. My Toxic Orange Pearl Coat test car was an R/T. Among its many attractions was the 5.7-liter Hemi V8 engine. Putting out 370 horsepower and 395 lb.-ft. of torque, it takes the 4,253-pound car from 0 to 60 mph in less than six seconds. The engine sound is pleasing to the ear, and with serious attention to filtering out all the undesirable wind and road noise, you can hear it clearly. Fuel economy numbers are 16 City and 25 Highway per the EPA. I averaged 17.1 mpg, which is pretty good for a big sporty car. And as gas prices moved above $4 a gallon during the Charger’s test week, that’s something to consider. The SE level uses a new 3.6-liter V6 that replaces two previous V6s, a 2.7 and a 3.5. Compared to the old 2.7, the 3.6 has 63 percent more horsepower, 292, and 36 percent more torque (260 lb.-ft.). Compared to the Hemi, it bumps up the fuel economy by a couple of miles per gallon and lowers the weight by a few hundred pounds, and it is by no means a slouch. The EPA Green Vehicle numbers for the Hemi are 6 for Air Pollution and just 3 for Greenhouse Gas, unsurprising for an engine of that size and power. The new Charger gets new suspension and steering settings. These include all-new premium hydrobushings, combined with new monotube shock absorbers, revised spring rates and redesigned front and rear multi-link suspension geometries. For a big car, the Charger handles tautly and smoothly. Steering is upgraded with an all-new electro-hydraulic power steering system that features 25 percent quicker steering, precision road feel and improved on-center tracking; it also reduces steering noise and fuel consumption. Prices start at $25,995 for the SE, including shipping. The R/T begins at $30,995. My test car had a heaping helping of extras, including the Road & Track package at a cost of $3,000, which brought in leather seats, heated second-row seats (nice), 20-inch chrome alloy wheels, a blacked-out grille and much more. The orange paint cost an extra $295. Several other packages added other desirable features. The bottom line on the window sticker was $38,835.